Three kids. Five cars. Three homes. Many, many road trips. One million bowls of cereal. Three thousand, two hundred and seven batches of chocolate cookies. Nine photo albums. That's how long we've been married. Then we partied hard all day on Tuesday, before heading home Tuesday afternoon. Yeah. We didn't even stay in the city for dinner on Tuesday night! I did love all the desserts that Travis bought me, which was a lot- as he seemed to be sucking up to me and bought me things like fresh, hot mini donuts. That is unheard of. I loved being with these two boys. They are the boys that throw the fewest tantrums per day, and love me the most, and never tell me that I'm a bad, mean mommy. We wandered around aimlessly, going into stores, cathedrals, and anything else that struck our fancy. It was nice to have no obligations or time limits! I also loved Chinatown! I felt like I was back in Bejing- I even saw old ladies buying dried shrimp candy in bulk. But the children (who were actually wearing seamless pants!) had underwear on. I didn't see anyone squat in the gutters. So that was good. It was the perfect amount of China for an afternoon. 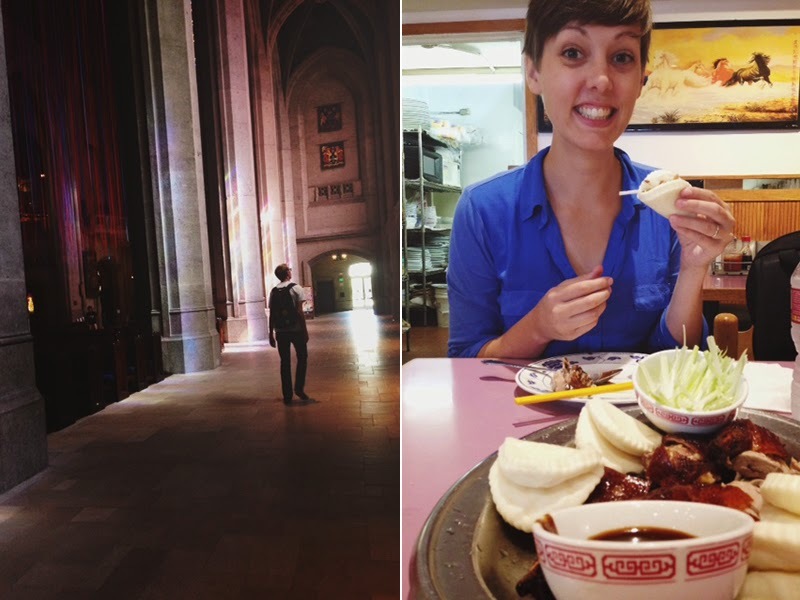 Here I am eating Peking Duck (above), which is one of the few meals from my trip to China that I remember thinking, "Holy crap. This is delicious. I want this all the time back in America." And yet, in the past 8 years- I'd never had it again! 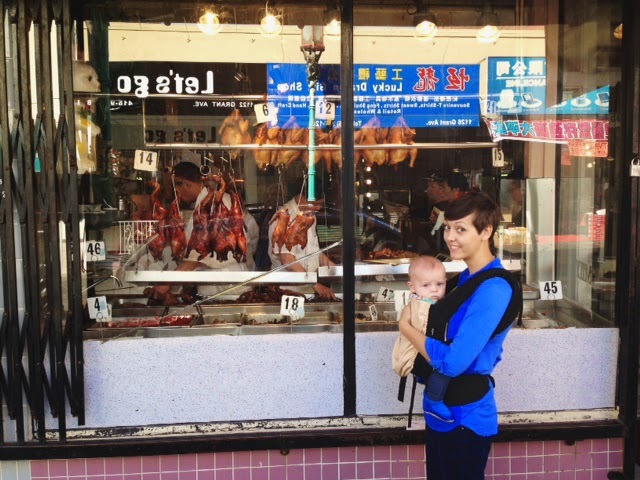 We walked into the first restaurant that had entire animal carcasses hanging in the window. No one inside looked at us. The menu and all the signs were in Chinese. I wandered around the room for a while before stopping someone and asking "Peking Duck?" He pointed to a table, "Sit down. I bring it." Travis insisted on taking my picture in front of the shop. I felt silly about it, and August was obviously against it too. August continues to be the best, nicest baby of all time. Everyone in Frisco loved him. Everyone! 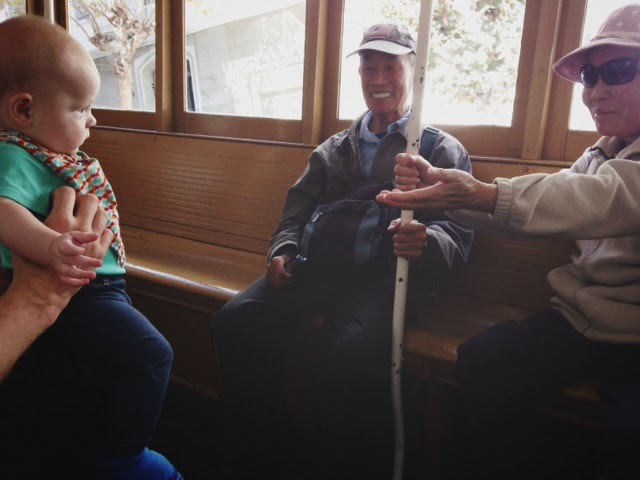 Even these old Asians wanted to take him home. He was not amused. In fact, he was a little worried that we might actually hand him over. Actually, though, not everyone loved him. It was strange to be in a city where people avoided making eye contact with us! August would see people and smile and coo at them, and I would even say things like, "Are you making friends?" and turn to smile at people and they would not look at us! Please. Stop pretending you can't hear and see us. We are obviously looking at you! Ah well. Their loss. They don't get to be friends with the nicest baby. 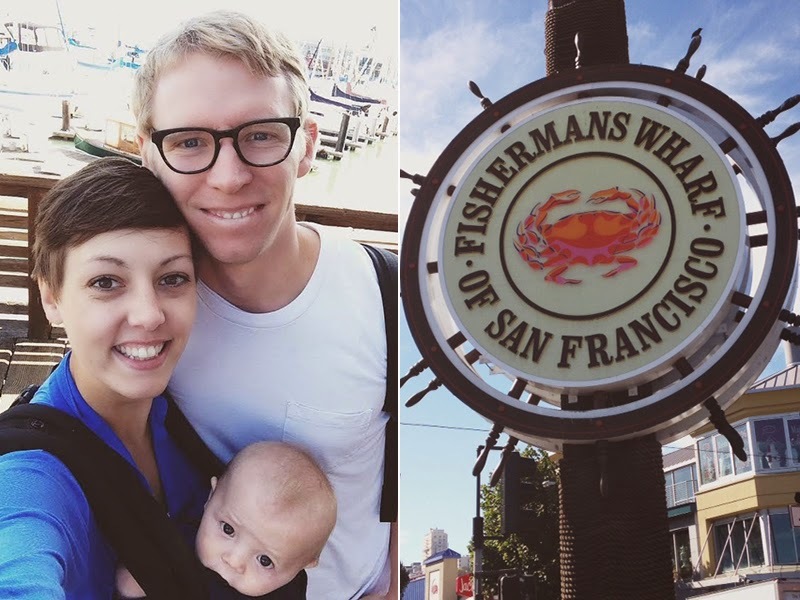 On our way to the City by the Bay, I said to Travis, "What is San Francisco's nickname? You know, there's The Big Apple. The Windy City. Family Town USA (Orem, Utah.) What is San Francisco?" He didn't know. So obviously I had to look up a list of nicknames for Shaky Town. Turns out, this city has a lot of nicknames. For some reason, they didn't have any nicknames referencing the fact that driving on the roads here is a little like being on a roller coaster. I have a good name suggestion! Car Sick City. Travis and I got to spend a few nights alone and explore a new city. We had fun. Our baby is cute. We are happily married, and glad to be home again. I've missed you, City of the Saints. Oh. I looked up a bunch of city nicknames. Once I started, I couldn't stop. 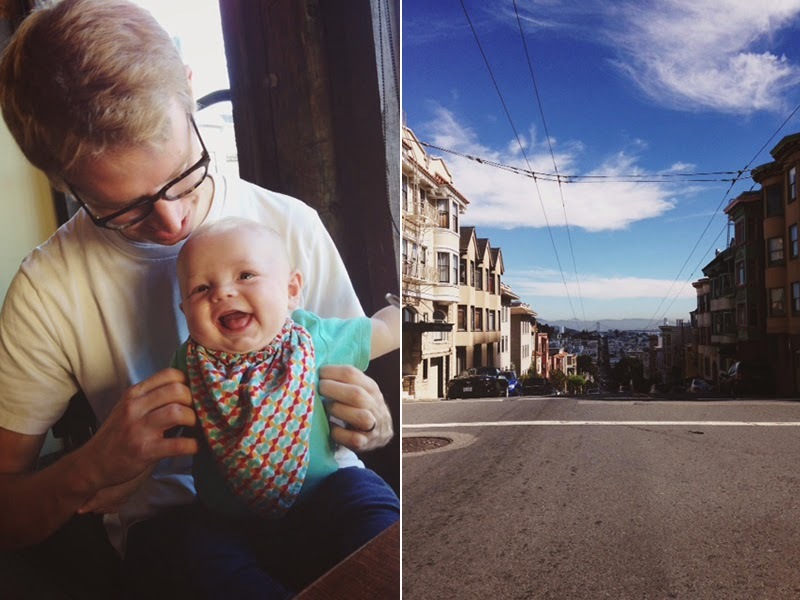 Though I'm pretty sure you're never supposed to call it Frisco, it looks like you had a fantastic time. I love (visiting) San Fran. Lets be clear that I had Grey and Micah from Sunday afternoon until Wednesday afternoon. You didn't get back on Tuesday. Nice try. Really cute post Becky. Haha on Polly's comment! And congratulations on 5 big wonderful years!